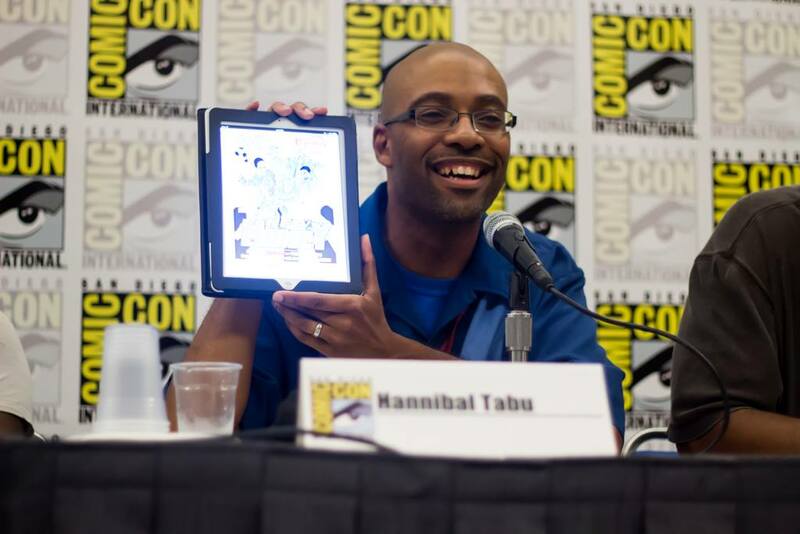 Born in Rockford, Illinois; raised in Memphis, Tennessee; matriculated in Tacoma, Washington and broadcasting live from Los Angeles, Hannibal Tabu is a writer, a brother, a husband, a misanthrope, a son, an emcee, an uncle, a poet, a father, a designer, a nephew, a romantic, a storyteller, and by god, a fan. He spent more than twenty years doing the journalist thing for Vibe, Slave Trade, MTV Online, The Los Angeles Wave Newspaper, Rap Pages, America Online, the Los Angeles Sentinel, Spinnerrack.com, Speak and The Source. Hannibal has worked as a web designer/producer and graphic artist for American Honda, eHobbies.com, Quicken.com, L.A. Care Health Plan, Express.com, the California Association of REALTORS, Disney Channel, NextPlanetOver.com, Toyota Motor Sales, Kaiser Permanente, California Bank & Trust and many more. As a poet, Hannibal has been published in The Drumming Between Us, (sic) Vice Verse, Drumvoices Review, Voices From Leimert Park and other anthologies, as well as being author of the collection BORN BENEATH AN ANGRY STAR and co-author of FLIGHT MANUAL. As a novelist, he's written THE CROWN: ASCENSION and FARAWAY (both available on Amazon, Barnes & Noble & Smashwords) and the upcoming sci fi political thriller ROGUE NATION. He's the winner of the 2012 Top Cow Talent Hunt, writer of New Money for Canon Comics, Waso: Will To Power for Stranger Comics, four issues of Project Wildfire for Legends Press, three issues of Menthu for Hometown Studios and co-writer of an award-winning issue of Watson & Holmes (alongside 2 Guns writer Steven Grant) for New Paradigm Studios. He has an ongoing relationship with Aspen Comics after writing four Aspen Sourcebooks for the makers of Fathom, Soulfire and more. For six years he was the editor-in-chief of the Los Angeles Herald-Dispatch group of newspapers, is currently the co-owner and editor-in-chief of the Black geek channel Komplicated at the Good Men Project, and uses his website (www.hannibaltabu.com) to publish his poetry, market what he's doing, rant at the world and emit strangled cries for help. In addition to all that, Hannibal collects comic books, has scores of action figures, DJs private parties, is a Mac OS zealot, sings and sometimes even hosts karaoke, practices a form of spirituality based on ancient Egyptian belief, and goes to bed every day, secretly hoping that half the world will commit suicide in his honor. For more information, visit HannibalTabu.com.